There are two Chanukkah stories. 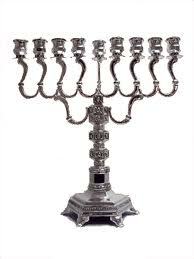 The Gemara (Shabbat 21b) asks, “What is Chanukkah?” and Rashi (ibid.) explains that the Gemara is asking which miracle the holiday commemorates because there are two different miracles. On the one hand, we have the miraculous military victory, which we recall in Al Hanissim: “You delivered the mighty into the hands of the weak, the many into the hands of the few . . . the wicked into the hands of the righteous.” On the other hand, the Gemara recalls the modest miracle of the oil that burned for eight days in the Temple. The first miracle demands a public celebration, “These Eight days Chabukkah for praise and thanksgiving.” The subdued Temple miracle is commemorated personally and privately; one candle for every family, lit in the doorway of their home. These two narratives, and these two celebrations, do not reflect attitudes towards Chanukkah alone. I believe that they reflect two different attitudes to Jewish nationalism that continue to have repercussions to this day. The military celebration marks political independence, as Maimonides writes (Laws of Chanukkah 3:1) “During the Second Temple period, when Greece ruled they passed decrees on Israel, outlawed their religion, and would not allow them to study Torah or fulfill commandments . . . until the God of our ancestors had mercy on them . . . and sovereignty returned to Israel for more than two hundred years. . . “ For many, sovereignty is the key element to Jewish survival. Without political independence, Torah can not be learned, and our mission on Earth can not be fulfilled. Even the far from perfect kingdoms of the Hasmoneans were therefore holy and worthy of celebration, because they allowed our nation the ability to fulfill our promise. The Menora commemoration celebrates spiritual independence. Each of us is required, in the privacy of our own homes, to affirm our connection to our people and our tradition. Rather than spread unity through the power of the State, this celebration, spreads unity through common practice and common faith. The Rabbis, in the wake of the failure of the Second Jewish Commonwealth, grew skeptical of the inherent value of political independence, and they charted a course for a long, dark future of exile. Rather than create a state which will allow for Jews to fulfill God’s will, they looked to create a nation that could span state boundaries, which would be marked by share culture and values, with the hope that one day that people would once again gain independence – and the new state would be defined by the ethics they transmitted. Today, as Israel continues to be attacked, these two attitudes are again visible. There are those who place sovereignty and the state above all. They view political independence as uniquely important – because they fear that without it we will not be able to express any of our other values. On the other hand, there are those who place those values first. They think that a political entity that does not live up to the standards of our ancestors has no worth at all. Therefore, they are willing to take what are seemingly great political risks in order to remain faithful to their morality. While these two attitudes are seemingly opposed, our tradition has managed to incorporate both of them into our Chanukkah celebration for two thousand years. Today too, we must be able to find a way for both sides of this argument to contribute constructively to our national dialogue and the future of our people.